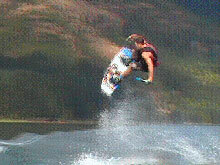 One of the most popular type of tricks in wakeboarding are off-axis spins. 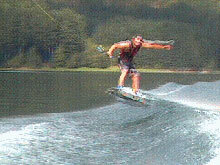 They look cool, are fun to do, and allow a rider to go big while also grabbing during their spin. Some riders have a lot of difficulty learning these type of spins however. 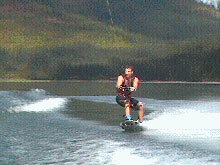 People tend to do it too much like an invert instead of a spin when first trying it. It's easier to do it flatter like a spin at first, then take it more and more off-axis. 2. Although not absolutely necessary, being able to do a Back Roll helps. Watch this trick as a Quicktime movie. The setup for a Heelside Off-Axis 360 is similar to a regular 360. Don't think you need to edge harder just because you're going off-axis. 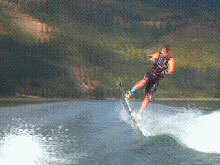 A key is move your hips a bit closer towards the boat so you can let them out when you take off. As you pop off the top of the wake, stand tall while letting your hips drift back, and you want to think about the nose of your board going straight up like you're going to do a nose grab. To make sure you go off-axis let your hips drift away from the boat and think about pulling the nose of the board up and around, almost like you're drawing a rainbow in the sky. To bring yourself down, make sure you pass the handle and trust that it will pull you down from your off-axis position. Begin looking for the boat as well. Keep that handle towards you front hip so you don't spin too far to a 540, and get your head and eyes looking at the shore. Make sure you land with your knees bent. The Heelside Off-Axis 360 helps you advance in the world of off-axis spins.